Empire Avenue is a social metrics platform that allows its users to connect all of their Social Media profiles in one location. Think of it as the tree trunk, with your social networks representing the branches. When the trunk grows larger, so does the rest of the tree. After linking your accounts, Empire Avenue compiles data from each individual network based on your activity, your audience, and the interaction they have with your content. Once your scores are calculated, you will receive a network rating from 1-100. These ratings represent your true measure of influence on each network, and serve as an excellent barometer on where you should focus your efforts and where you’re strongest. So there’s a Stock Market, too? How much will they have to spend to purchase my shares? The Share Price is how much someone will pay, in Eaves, to purchase a single share in you. The price is calculated based on your online activity in your Top 5 connected networks, as well as how frequently users buy and sell your shares. Each individual profile has a trend line documenting the user’s 30-day share price, as well as the daily dividend payouts to help investors make wise decisions. You will also have access to a detailed analysis of your portfolio to help you monitor your own investments. Dividends are perhaps the most heavily-weighted factor in determining whether or not a user will invest in you. They need incentive, and that incentive usually lies in the daily payouts they will receive as a shareholder. The three factors used in calculating your dividend payouts are your daily activities, the reaction of your audience, and your network scores. As a reward for your daily engagement, your dividend payouts will rise, thus making you more appealing to potential investors, which will ultimately increase your revenue when they purchase shares. How will Empire Avenue benefit me? What Empire Avenue helps you achieve is far beyond the simple accumulation of virtual wealth. When people invest in you, what they’re really doing is initiating a potentially valuable online relationship. 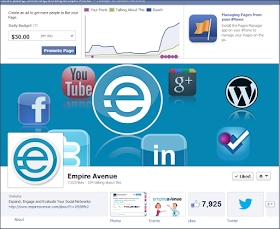 Empire Avenue manages to combine every major social network, and has established a community whose primary focus is on engagement. These mutual relationships lead to more retweets, likes, shares, pluses, and pins for everyone involved. If you’ve been sleeping for the past few months, that means drastically increased SEO for your blog or website, and who doesn’t want that? What else can I do with my virtual currency? More SEO, please! Empire Avenue allows you to setup custom “missions” to get your content found. A mission is the equivalent of paying someone to “like” a link, or to share it to their Facebook wall, only instead of real money we’re using Eaves. With Empire Avenue, the world finally has what it’s been waiting for: the glue that holds all of your social networks together with the added benefit of increased SEO. They don’t call it “Social Media Rocket Fuel” for nothing! Click the link below to sign up. Early adopters always have the edge. Invest smart, engage, and watch your networks explode! Stay tuned for more on Empire Avenue in future write-ups, as we’ll help take you from Social Media Zero, to Social Media Hero!